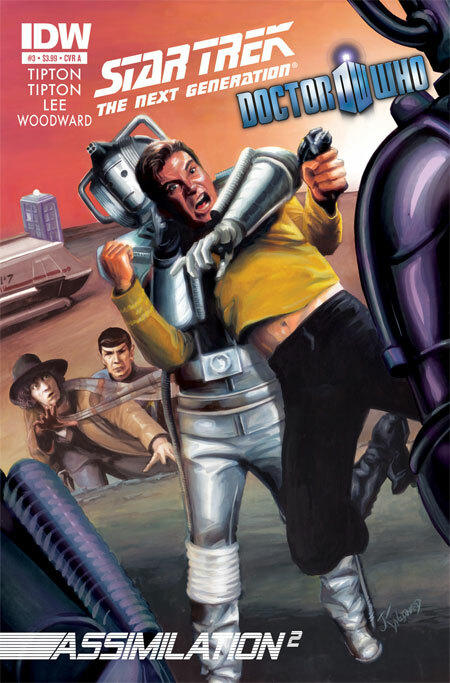 Yesterday I popped down to my local comic shop to pick up the first issue of the new Doctor Who Star Trek: the Next Generation crossover comic: Assimilation 2. Ever since I heard that this comic was coming out, I have been excited. Though, I am not a huge fan of Star Trek I have always liked the idea of crossover media, and even more so with Doctor Who. The comic was released with several different covers. They had two of them at the shop I go to, and I picked the one that I liked the best. I try not to be a cover completest, so I go for what looks good to me. My choices were cover a or cover b. I chose cover b mainly because out of the two it was much more comic book like! I like the hand drawn aspect of comic books, and have never been a fan of comics with actual photos on them. This becomes important soon. As I opened the comic up I was shocked to find the art was not what I was hoping for. While J.K. Woodward's art is fantastic, I just don't like this realistic style of art in comic books. It takes me out of the action for some reason. The images look as if Woodward found the appropriate photographs for the composition he wanted to make, traced them, and painted their tracings. This isn't a criticism of the style, more of a personal taste. However, I do feel it promotes an epic feel, which I feel it what they are going for with this story. The series is written by Scott and David Tipton with Tony Lee. And for the most part this issue focuses on the TARDIS crew. This first issue is very much a set up for what is to come. 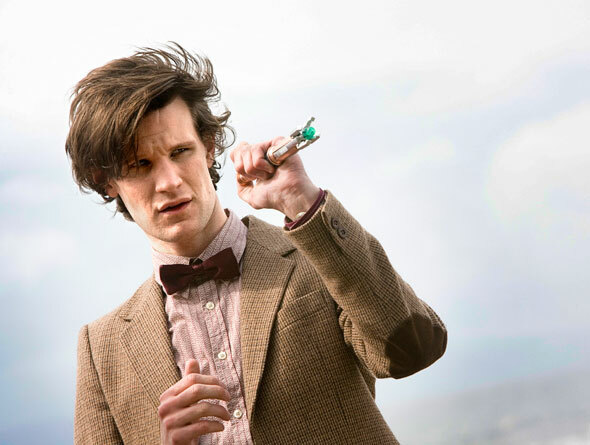 The reader gets a very basic idea of what is going on in the first few pages, then they are swept off on a seemingly unconnected adventure with the Doctor, Amy, and Rory. The Characterization is pretty spot on for the characters and their voices are captured very well I think! 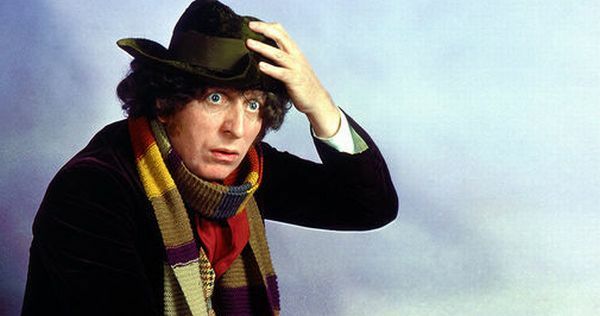 The Doctor is very much in character, wearing a hat that I am sure he picked up on the adventure, which he tends to do. Rory gets to dig down and explore a little bit about his Roman days. It really is a strength of the writing. As the story progressed the Doctor Who bits are very spot on, but to be honest we see very little of the Star Trek universe. I was actually glad to see a real focus on the whoniverse in this issue, but I think a little more of the Trek universe would have made it a little more accessible to trek fans! I would say that the biggest weakness of this book is that it is, indeed, a set up for what is to come. We get no real indication of what is going on, and it seems like the issue is more concerned with a seemingly unrelated adventure for the Doctor than the actual crossover. We get only a few pages of some federation content near the beginning of the book, and only see the Star Trek cast on the last page, which I find to be unfortunate. I feel that the action could have started earlier. Now, I have to wait to get ant of the good "Explaining why your there" kind of stuff! Over all it was a good book, but I think this is going to be better enjoyed as a complete series than as individual issues. I feel that the art could stand to be a bit more "comic book" in nature, but I admit that is a personal opinion and that others will probably find it epic in nature. I am looking forward to get a little more background info in the next issue and perhaps find out why the Borg and Cybermen are working together! I recomend this comic! I think if you look at it for what the whole is going to be it will be a fantastic story, even id this issue was the pre-credit sequence to the series! This past weekend as I was shuffling through the dealer room at Timegate , I stopped to talk to a friend of mine who was vending. I was looking through his comics and the other things he had, when he showed me something really interesting. He pulled out several issues of Famous Monsters of Filmland from the 60s. 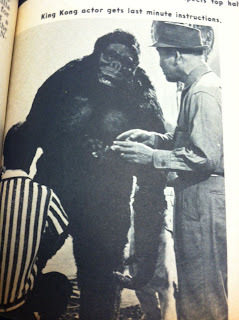 I have never been a big fan of monster movies, I appreciate them but they have never really appealed to me. These Magazines spoke to me on a certain level though. They called to me from their black and white pages and said "Take us Home." I could not say no to the primal instincts that suggested that I buy them. I was intrigued, having recently watched American Scary and heard the references to Famous Monsters and the importance that was put on it for the development of the horror hosts of the era. I found that it is a very important historical document, and I wanted to see what it was all about. Simply looking at the cover of these books take you back, and I can imagine kids of the time standing at news stand staring at these covers for as long as their parents would let them. The cover images were very compelling for the era. 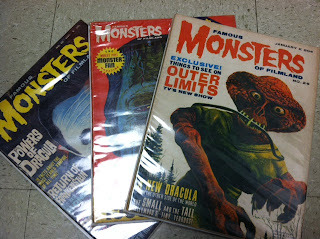 these covers also remind me of how important these monster movies and characters were to kids. Where my generation has Star Wars their generation had the monster movies. It was the kind of thing that the kids would sneak and watch and then scare them selves so that they couldn't actually go to sleep. The magazine is the kind of product that kids would sneak into school to look at with their friends. Some of the images would have been quite graphic back then and I could imagine kids taking them into the school only to getting them taken up by their teachers. Going into the inside of these magazines you can see they feel much different than a modern magazine, most of the text is little more than the captions you would find in a magazine on the news stands today! The pictures. . . That was and still is the draw. though all of these pictures are passe today with the advent of the internet, in the 50s and 60s these black and white images would have been gold to the readers of the magazine. Many of the images were first published in this magazine and it was the first place they had actually been seen! It was an important document for that! Also for the movies that were actually being made while the magazine was being produced the writers were becoming actual journalists and were being let on set and were allowed to take pictures. 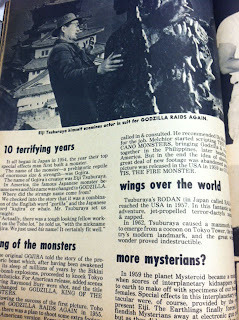 The magazine did not just focus on movies being made in this country either, but also dealt with a lot of Japanese titles such as Godzilla. Considering the importance of Godzilla in the monster movie circuit it was a great way to expose audiences to some of the behind the scene aspects of the making of the gigantic Lizard himself. 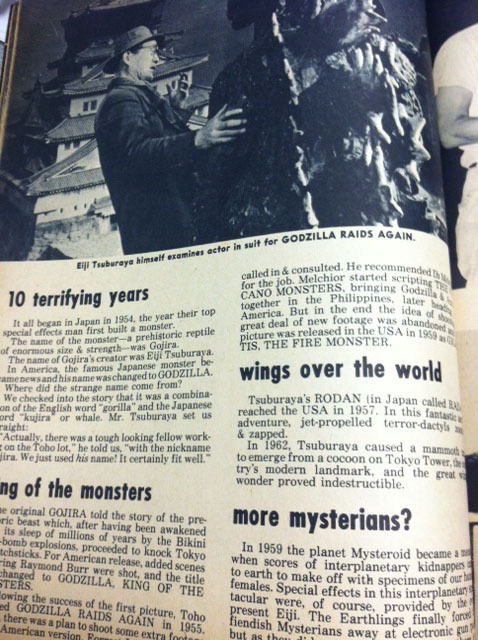 In an issue I picked up there is a feature on Godzilla, and while the writing leaves a bit to be desired and I even question some of their "facts" I realize how young children and monster movie buffs would have salivated in anticipation for the next issue. 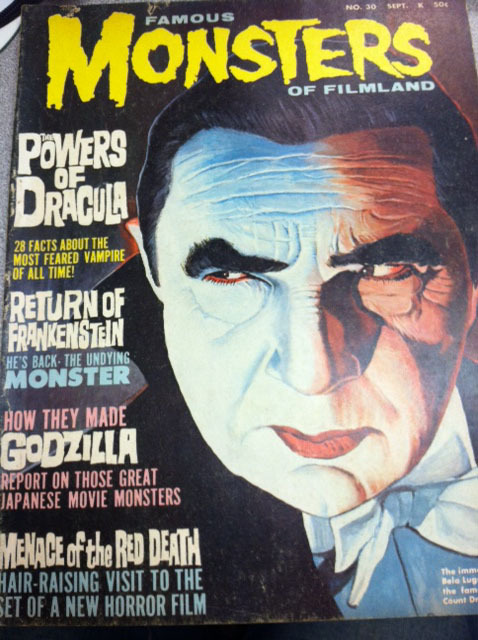 Famous Monsters of Filmland is a very important part of the American Pop Culture legacy that I have missed out on for most of my adult life. It is a magazine that has inspired numerous movie makers and pop culture personalities over the lat 5 decades. If you get a chance to pick up some of the vintage issues do it, if for nothing else than a history lesson in the early years of pop culture publications. Do you have memories of Famous Monsters of Filmland? Has it influenced you in your writing or reading habits? Is there another Pop Culture Publication that you think people should know about? Let us know! Buster, my puppet making an appearance! Being a director at a con is much different than being a con attendee. As one would expect the experience changes. Your fun factor shifts, and for me it shifts for the better. I have been the co-director of Timegate for the past three years. It has honestly been a life changing experience. three years ago I jumped into water that was WAY over my head and Since then I have came up to the surface a bit. As a person it has changed me to be a bit more personable, a bit more outspoken, and a bit more critical of what I say. I have seen different ways to run presentations, and I have found myself to be more versatile. As a director you have to be many things, a Carnival caller, a mediator if problems arise, a moderator to try to let every one have their chance to talk. 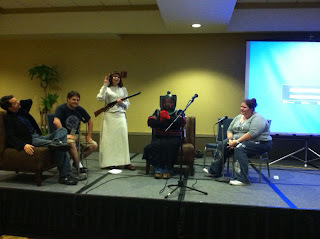 This year at Timegate has been no different, it was a great time being on "that side" of the panel room. The guests were all GREAT! the attendees all came with GREAT questions! It seemed that everyone went away happy. As always I walked away from the weekend with new friends. Of course you don't want to hear my fluffy ramblings about life changes, YOU want to hear about the convention. . . So, fearless reader, I give you my thoughts on the weekend, but you have to realize I was in my panel room most of the time. Timegate is a convention full of costumes, and friends and love for the two franchises it represents. The weekend started on Friday. My favorite part is always coming down to the lobby for the first time. you see the people registering, and picking up their badges, and you see friends. this year was no different immediately I was greeted with the faces of my dear timegate friends that I see once a year. The people who run the con, and the people who help with my tracks. all of them are fantastic people and seeing them is an event of it's own. The panels began without a hitch. This year we were in a much larger room and our first panel took advantage of it. It was a great packed panel that focused on "companions" the panel was great, and our panelists really started the weekend of with a bang! and Friday night continued like that. Friday is always the busiest. I didn't even have time to take more than a cursory look through the vendor room on Friday! 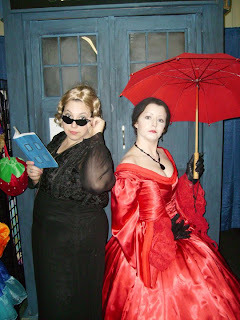 The night eneded with an open mic fan cometary of the new edition of the classic story "Day of the Daleks"! We had some great commentators in there who seemed to really have fun. Saturday is always the big day and the panels kept bringing in the crowds and the panelists were ALL so great! The real events started on Saturday as well with the $25000 Pyramid of Mars where we married A game show and Sutek Destroyer of Worlds! We had Josh Wilson and Lars Pearson of Mad Norwegian press as our "Celebrity guests" and it was a lot of fun! We really enjoyed it and the audience did to! We had some great contestants a lot of great laughter! The questions we found were very hard! The panels continued to be great, But, as it does every year, the anticipation built us toward the script read through at the end of the night on saturday. during the script read through we go through my library of unmade scripts and we have a dramatic reading of one. I have to give huge props to my co-director, Martin Hennessee, and Bill Ritch of the Atlanta Radio Theater, for helping a top notch performance take place! Sunday continued to be great and panels went on, but on Sunday we got the best quote ever from a young attendee, when asked what his favorite thing about Doctor who was he said "The TARDIS - it travels through time and space. . . Isn't that enough" it was GREAT! the enthusiasm of the younger demographic was fantastic! Every thing about the con out did itself this year. The dealer room was great, I will be doing another post about some of the things I picked up this year. The whole con was great I do want to give a few shout outs to some people who made it great! and this is not an extensive list, and I apologize if I miss some people. Alan Siler is such a good friend and is the guy that makes Timegate happen, so big props to him! Marten Hennessee is my partner in crime and my co-director. I couldn't do it without him! Scott and Sacha both participate in The articles of the Shadow Proclamation Podcast and have a very cool new project coming very soon! George Cockrell is the best unpaid scientific adviser a con could ask for! Bill Ritch and the Atlanta Radio Theater Company helped us TONs. If you get the chance to see one of their productions please DO! Ken Spivey of the Ken Spivey Band has some great music! Kathy Sullivan shares a last name with dear Harry, and really knows her stuff! Check out her books! Denise Bagley who is usually our only staffer who could not be there this year, but she showed up anyway! Thanks Denise! I would be remiss if I did not thank my wife as well for letting me participating in this even every year over our anniversary weekend. THANK YOU! Also ALL of the people who attended the con and the panels. There were lots of new who fans who have an interest for the new series AND have a huge respect for the classic series! I am so glad to see that, so if you guys have any questions ASK! I wait for this weekend every year. Every year I take a pilgrimage down to Atlanta to participate in Timegate, a Doctor who and Stargate convention. It is a great time to see a lot of great friends that I see once a year. So I am excited. Once again you get a be back later post for Friday. I hope to have lots of coverage from the event that may come through the weekend but may come on Monday. For anybody who stumbled upon this blog because of cards or buttons you got at the con. . . WELCOME! I hope to join you soon! The League has called and this time I am stumped. This week the League has asked us to take a look at what the social media of a fictional character would look like. It's a great opportunity for a character study, but who to study. . . this is going to be one of those stream of consciousness posts. . . I can already feel it. 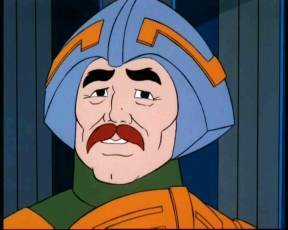 He-man is a mussel bound Nincompoop. 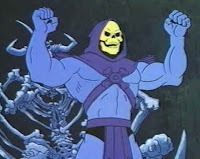 Skeletor, If you can't say nothing good. 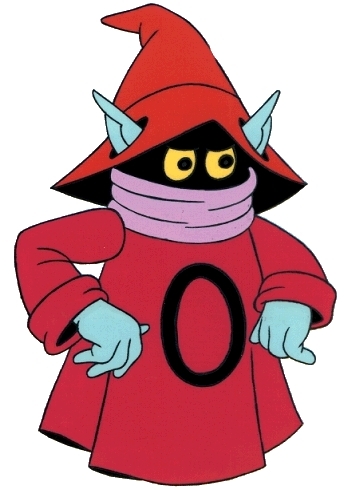 . .
Orko - Trying a new spell. So in a way I don't think it would be much different than their dialogue is already. 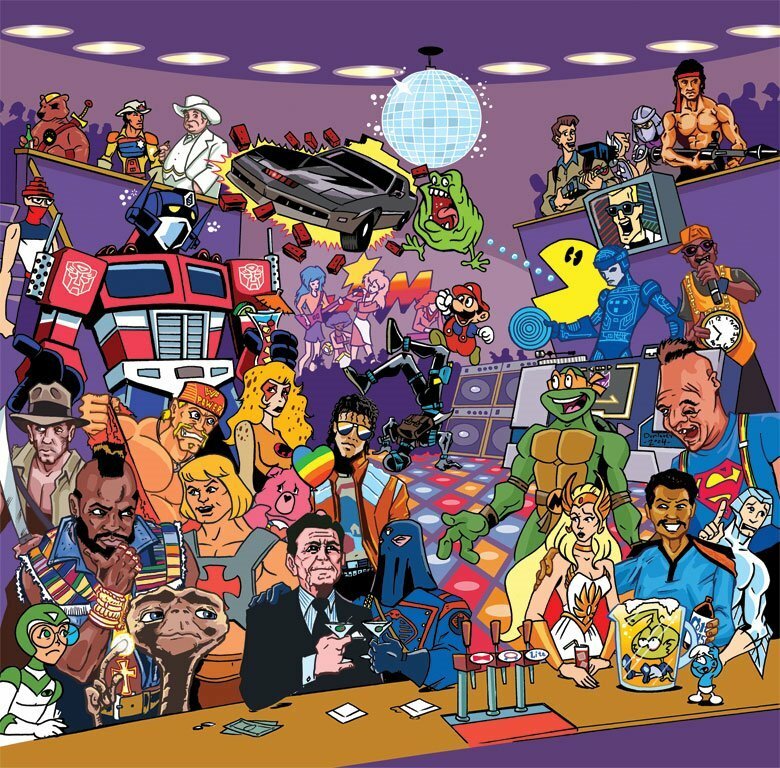 What I would be curious to see is what the 80's cartoonsphear of social media would be like. If all of the characters from different franchises communicated. I would imagine that There would be a lot of fighting in that. So you would have all of the villains trying to be the most villainous, and things like that. I would imagine that there would also be a lot of franchise fighting. 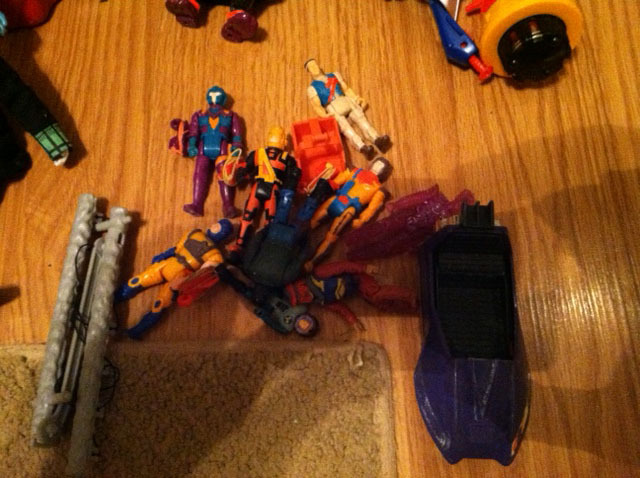 the Transformers would be fighting with the go-bots, and MASK would be fighting with G.I Joe. But there would also be groups. you would have Leader Groups where all of the leaders could get together and talk about the burdens of being a leader. I would love to see Leader - 1 and Optimus prime in some of these social media conversations. There would also be barbarian groups with Thundar, and He-man and any number of other fantasy characters. But I would also imagine there would be advocacy groups where the characters could share their public service announcements! What do you think, what fictional social media conversations would you love to see! Check out some of these other league posts! 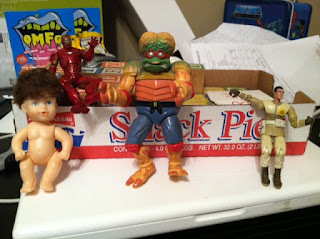 The Dork Hoard imagines a wookie page! This is a slightly different kind of post for me, but something I have been wanting to compile for a while! Schools are out and, at least in my neck of the woods, the temperatures are rising and it is time to roll those windows down and blast your favorite summer music! I am going to count down some of my favorite summer songs to blast with rolled down windows! this is not a comprehensive list and most of these are all nostalgic for me. there are lots more on my Radar but these are some of my favorites that when I hear them I am forced to roll the windows down. Kate by Ben Folds Five - this is just a great song. Almost any Ben Folds song will make me roll the windows down, but this one screams summer to me! Crocodile Rock by Elton John - This is the summer song for me. This is the song that when I hear it I know summer has started! Sabotage - the Beastie Boys - a fun song to drive fast to, while feeling the wind in your hair. Amish Paradise -Weird Al - Ok this is not one most people are going to think of, but this one is nostalgic for me, I am back in 10th grade making fun of the cruisers in my town. Being threatened with my life! Don't Stop Me Now - Queen - A great song to get somewhere with. . . Also a great song for killing zombies. Mrs. Robinson - A little lower key, but a song that sings summer break to me. Back in the USSR - the Beatles - I grew up on the Beatles and I could put any Beatle song in this category, but I thought this song said it well. Don't worry be Happy - Bobby McFerrin - a song that makes summer for me. Schools Out for Summer - Alice Cooper - not a first choice, but it is THE out of school song, and Summer song. Wipe Out = The Ventures - just try to listen to this song with the windows up! What are your favorite windows down songs? There are some great ones I would love to hear your thoughts? HWY 11 Yard Sale Finds! 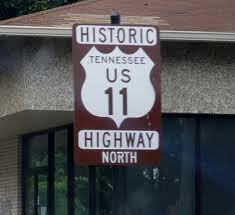 This last weekend was the annual HWY 11 yard sale known as the Antique Ally. Every year there are all kinds of vendors selling antiques and my favorite JUNK! Lots of Junk dealers. I spent the good portion of the weekend going up and down the hwy seeing what I could find, and I found some good things. I like to buy collections when I get a chance, and this weekend was no different, I bought in lots. I do not have pictures of every thing I got, as some of it went with my brother, who vend with, but some of the more unique pieces I have put here for your observation. I bought a lot of different stuff. On top of all of this I picked up over 7 boxes of comics that I will be going through over the next few days. A few highlights: a vintage star wars collection, a mego penguin and the Remco Flying Dutchman. 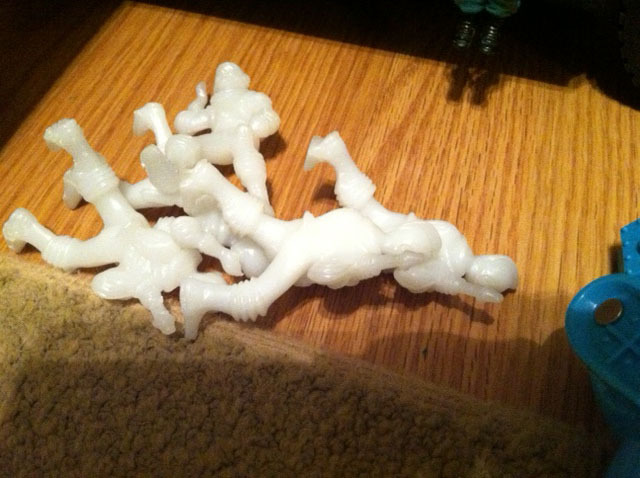 Also a small collection of glow in the dark Repro Archer Space men. even got a few things for free! This one is for my collection. 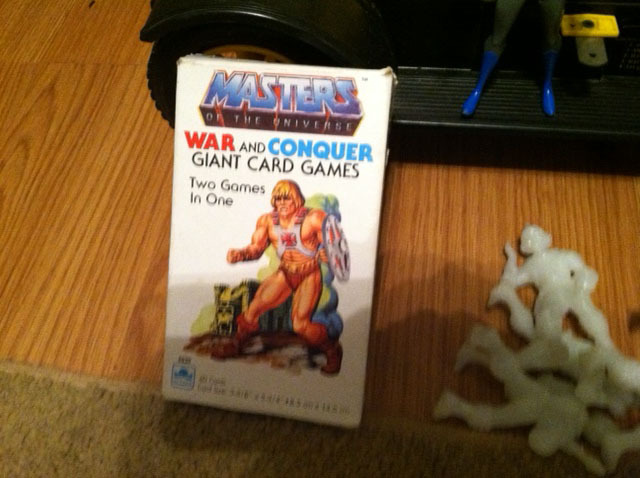 I got this in a lot of He-man and various 80s toy stuff. 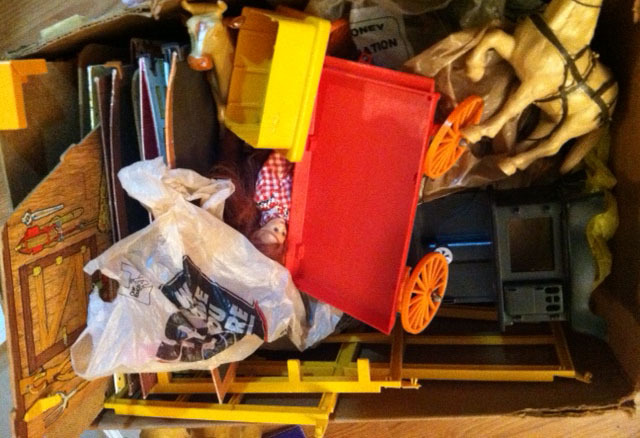 I got this box full of dolls and play sets of a line from 1975 called Jody. Don't know much about it but I only payed $5 so not too bad. 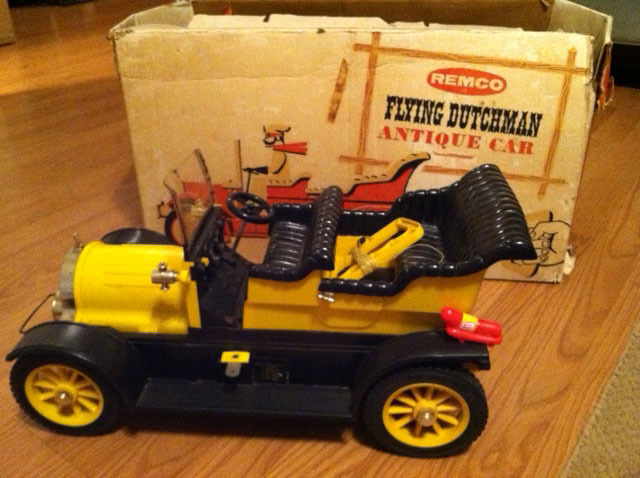 This is a 60s vintage Flying Dutchman by REMCO, I was interested in it because it looks like Bessie from Doctor Who. Not sure if I am going to sell it or not. but I might! Here are the archer repro figs. I have been talking to Brian over at cool and collected we can not find out much about them, but they are interesting! There are some highlights, there were a lot more loose stuff that I got that will go into our bins here and there. I will try to post about some of that in the next few days! 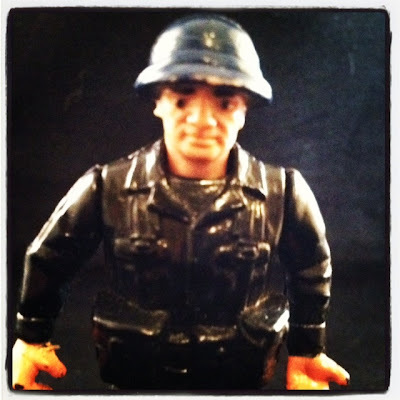 Gone Treasure Hunting - Be Back Soon! Due to the HWY 11 Yard Sale I am treasure hunting today. So I may not get a chance to post. For all of you who are doing the yard sale this year good luck and happy hunting! This weeks league topic comes right out and asks what do you not get? What is something that you just can't wrap your head around, or maybe you just don't like? Share your True Confessions! Ok I was going to write about something like zombie movies (I just don't see the appeal) but then I realized I have been planning on writing this post for a long time. . . be warned its going to get ranty. These are my opinions and do not reflect on my thoughts of any one. I am not judging anyone simply saying that I don't get it. as I have A LOT of friends who fall into this category. Also in the pictures I am posting here they are good friends and this is not representing any of my thoughts about them, I simply am discussing something I don't get personally. 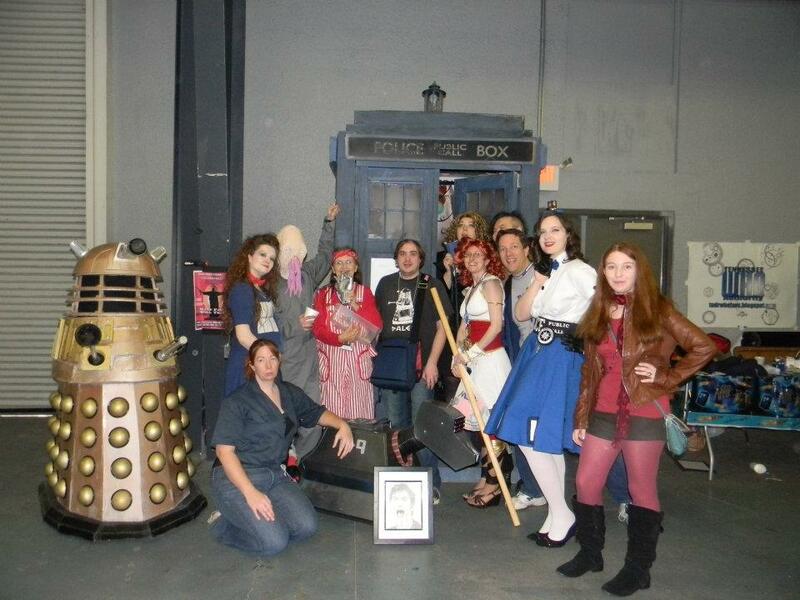 Here is my geek confession: I don't get costuming. Its one of those things I just don't get, but I do respect it. I like dressing up, I do. I like doing characters. 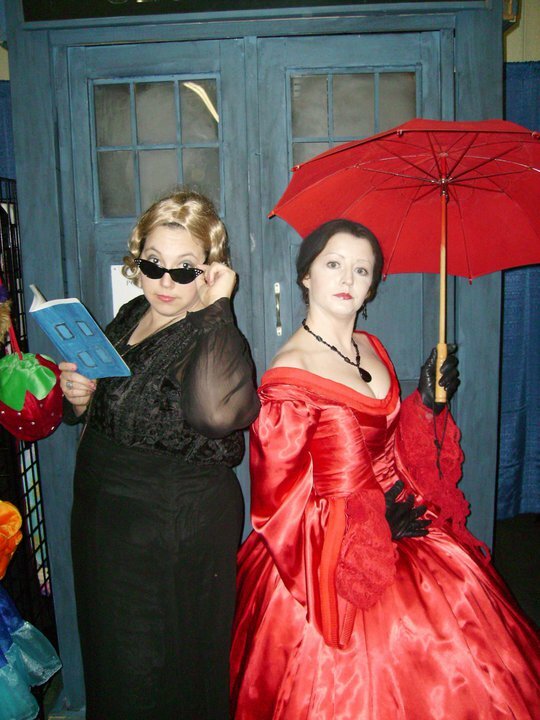 But costuming at conventions really looses its appeal to me. . . I wish it didn't. I would love to do it, but it would bother me and I would take the costume off after an hour. There are some awesome costumes out there! Its typically not the costuming that bothers me. Its the amount of time I have seen people research a shirt or shoes but couldn't tell you who wrote the episode that they are using as reference. This irks me. It probably shouldn't but it does. To me knowledge in fandom is king. Now, I would also be remiss if I didn't say that that statement is in regards to a small percentage of costumers. 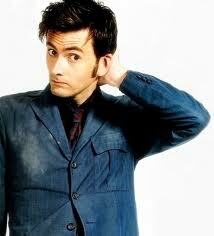 I am coming from the perspective of Doctor Who fandom. I have been a fan of the show for my entire life and have been involved in organized fandom for about 10 years. When I was a teenager I found every piece of nonfiction I could on the show. I could tell you writers, producers, production assistants. That kind of stuff to me is as important as the story. It is odd to me that there are people who come in from a different direction. Notice I did not say it was wrong for them to do that! As I said, I respect it and enjoy seeing the costumes but sometimes I question why people would dress up but not immerse themselves in the non-fiction behind the fiction. I am sure someone could ask me the exact opposite question! Just me? What are your thoughts on costumes, and costumers? Are you a costumer? Help me understand why it is so important and why you love doing it. Lets converse about this! For the other side of this take a look at my friend Rachel's Blog. She has some great costuming insight! Watch this space for more posts from league members. Memories of Tomorrow doesn't like games! The surfing Pizza has never beaten Super Mario Bros.
Haxbee admits he's an imposter! Even today, golden books have been a standard in kids books. The classics are best known as the little engine that could sort of thing. Great morals and fun stories for kids. But Golden books and many other publishers put out other books too, many of them tying in with pop culture licenses. The golden book's line was called "Super Golden"
I have fond memories of these books and have been tracking some of them down and I am going to begin to do some posts with cometary on some of these these books, and there is no time like the present, so I am going to jump right in with "War of the Gobots"
The go-bots get a bad rap any way for being the redheaded step child of the transformer (even though they came first) so a book for this line is going to get some mixed reaction. This particular super golden book is probably one of the weakest in terms of art, but there are some parts that stand out to me. I had this particular book as a kid and it always confused me. It was kind of dark, and the cover didn't help that. The cover depicted a painted scene from the book and it all seems normal, except for Scooter, who seems to be busting up Turbo, with a menacing grin. If you watched the Cartoon as a kid, these were both good guys. This always seemed off to me. Perhaps the artist was trying to depict Scooter fixing Turbo. . . if so he failed. Bits of the book look as if they just lifted parts from the toy instructions. I always felt they tried too hard to make cy-kill menacing. In this case they felt the need to show his face face. The art in general isn't terrible, but it does feel as if the artist is phoning this in! Even in the cartoon the bad guys (Renegades) always felt like they were over compensating with the size of their weapons! Then you get to meet the good guys, all of them smiling. . . you know because they are the good guys! And this is here the story kind of gets depressing (and confusing all at the same time. 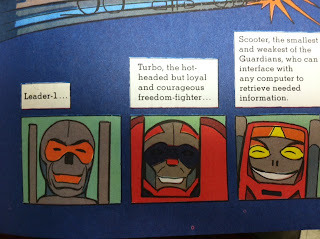 Cy-Kill shoots turbo from his wheel, Leader-1 protects him, and scooter makes a snide remark. 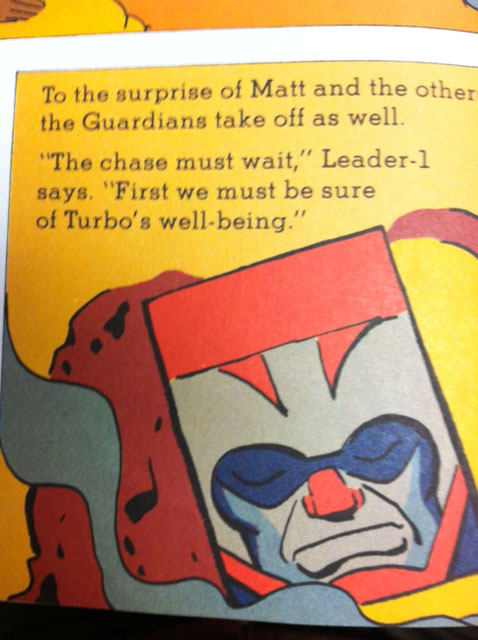 The text makes us think Turbo will be OK, but the image shows his head disembodied. Seems a bit much I think! 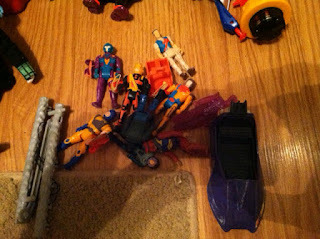 And that is War of the Go-bots. It weighs in at a whopping 23 pages and is a pretty easy reader, with simple sentences which are perfect for the very young children it was geared toward. So tell me, do you have memories of Super golden Books or other children's books? Share them! Gearing up for HWY 11 Yard Sale! This coming weekend is the Hwy 11 Yard Sale. Officially called Antique Ally, The yard sale stretches for more than 500 Miles. Luckily, hwy 11 runs right down the center of my town and I plan on spending a couple of days this weekend scoping out the sales and sights. There truly is nothing like a long yard sale event. People with space sell it and create little flea markets all up and down either side of the street. These little flea markets are a lot of fun, but those are usually the professional traveling vendors that are set up there so the prices aren't usually quite a s good. 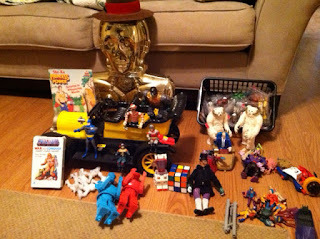 In my experience is, that if you are looking for toys, those little plastic nuggets of joy, you want to scope out the local yard sales. The ones that are fund raisers, or the family yard sales. Those are where the gold is. 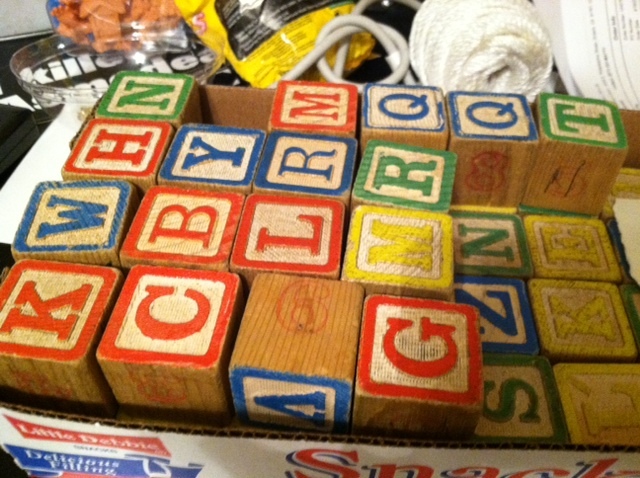 People donating, and cleaning out, That is where I have found a lot of cool stuff! Not a great day, but I didn't come home empty handed. Is anyone else planning on jumping into the HWY 11 yard sale. It is well worth it if you are near by! The Avengers and the rebirth of the Toy Industry. Over the last few years I have seen a decline in 1) the quality of movie tie in toys and 2) the sales of movie toe in toys. For the last few Marvel movies it has been tough to move those toys, at least in my neck of the woods. 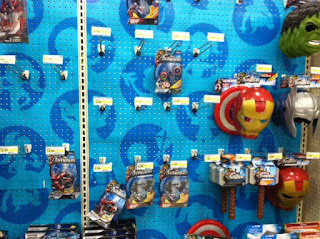 I will go into my local Target or Wal-Mart and there is a huge section of Thor, or Captain America just hanging around. To the point that I could go in on just about any given day and get a hold of the chase figures. They all then land in the clearance section at crazy reduced prices. The Avengers may have changed that! Before the movie hit last week I went into my local Target and it was the same old same old. The pegs were packed with all of the various avengers toys. Lots of them, they were full pegs! I made my way back on Sunday and happened down the toy aisle. They were all gone! There were a few stragglers, but for the most part the shelves were bare. I was curious so I made my way to Wal-Mart. The same thing! It feels like all the kids that got went to go see the movie made a run on the toy aisle the next day! That's the way it used to be. It has to say something about the movie to drive kids to the stores to want to buy these toys. This has not been the trend in recent years. Toys sales are suffering. I've written about my thoughts on this before, and I stand by that, but there is something special in the air about this movie. 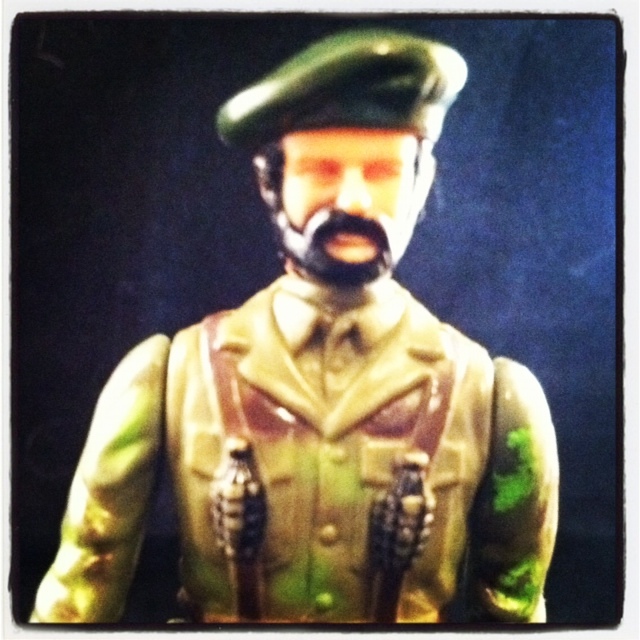 Could the movie bring a resurgent interest in toys for kids. Do they want something tangible again? Am I just forgetting that this happens with every major movie? What are your thoughts on toy sales as they relate to the Avengers movie? Would love to hear your thoughts! I have been working on some little projects for a long time, but nothing has really came to fruition with them so I am putting something on here to get me going with it. A tease if you will. A tease to get me motivated more than to get you, my intrepid reader excited. This tease is a new idea that I am putting onto an old idea so I'm really not sure what it will turn into, but if I post it at least exists. this was quickly done but it gets the point across. This is a long term project so this is nothing you will see anytime soon, but I am working on it and as I slowly work though what it will Hopefully turn into I will post about it from time to time. 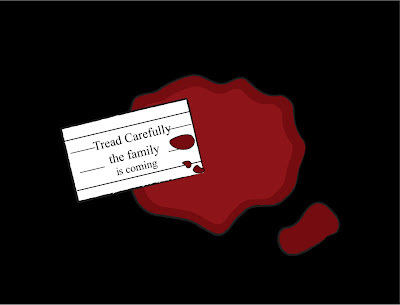 So keep your eyes open because the family is coming! I can't leave things alone. Even when they really need to be left alone. Now that I have created some promotional material and have most of it in my grasp. . . I decided to change the logo. In anticipation of doing some more promotional material, I decided to tinker with it as there were things I wanted to add but was unable to figure out how to do it in the old configuration. The previous logo AND the current logo have been inspired by Jack Kirby's Kamandi comics. I decided to take a different approach to the same thing. I don't foresee any other major changes to the log in the near future. What do you guys think of this change, or of the Logo in general. I would love to hear your thoughts! The League: Ultimate Crossover Event! This week the League asks us to talk about a team up or "Franchise" crossover you would love to see. This one took me a while to get my head around, but in the end I realized I had an answer, and I am actually going to get to see that team up later this summer! What pop culture heroes or stories would make for the ultimate crossover–think along the lines of Han Solo meeting up with Firefly’s Mal on a smuggling run. 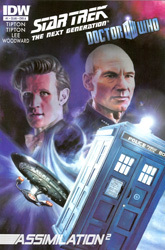 There has been a strange fascination with wanting to see a Doctor Who / Star trek crossover for years. 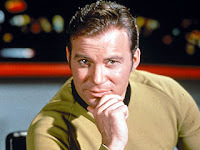 Back in the 70s fan fiction was beginning to thrive and there was a well known publication called the "Doctor and the Enterprise" (you can actually check it out here.) Since the 70s and with the continual resurrection of Star Trek every few years there has been an interest to see the Two Franchises meet. Of course the interesting thing about the two franchises is that you have multiple eras in each franchise. There is a plethora of combinations you could have. Original series enterprise and any number of doctors, Next Generation Enterprise with any number of doctors. 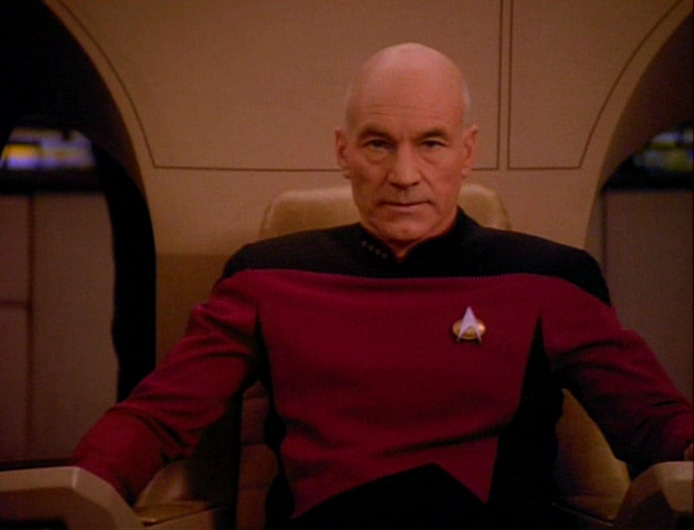 You could even have new movie trek in there. (hmm Moffat and Abrams co-writing / producing something could be interesting) There are so many options. All that said this Actually is happening in an officially licensed product. IDW has the rights to both franchises and they will be releasing a new comic crossover event this summer with both franchises. I am very excited to see where this can go. According to the covers it looks as though there will be some legacy material in here as well so we will get a few different combinations. The most interesting part is the villains they have chosen. 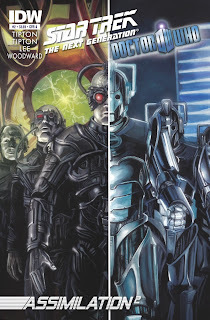 The Borg from the Trek universe and the Cybermen from the Whoniverse. the interesting part about this is that for years in the Who community there has been a lot of "You ripped the Cybermen off with the Borg" in our arguments in the eternal war with trek. I am curious how it plays out. This is a crossover I think lots of people would love to see, because there is a lot of potential for conflict. 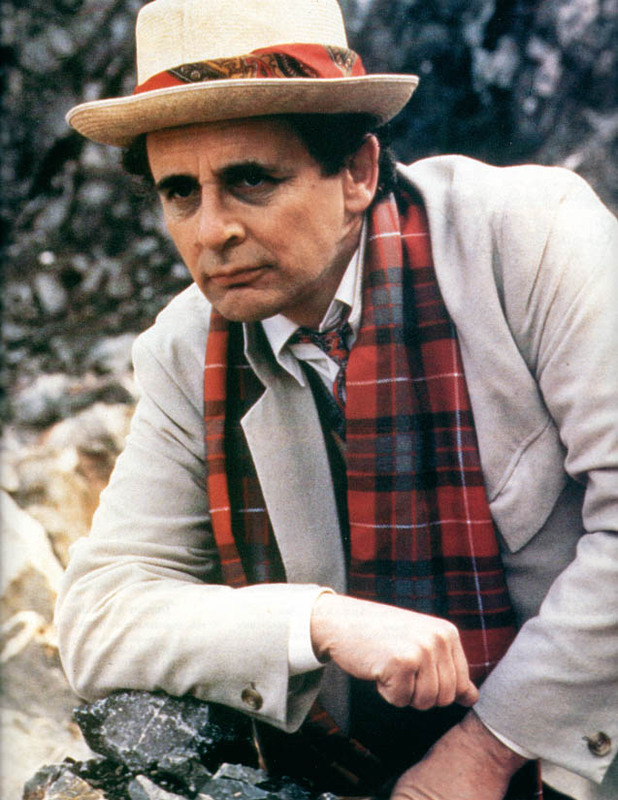 If you think about it, the story could begin like many classic Doctor Who stories. 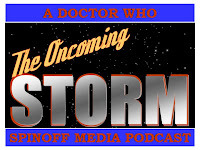 The TARDIS lands on a space ship and something bad happens, the TARDIS crew is blamed, adventures ensue! Ready made classic! The Great thing about Doctor Who is that you can put the characters anywhere, so it is ready made for crossovers. 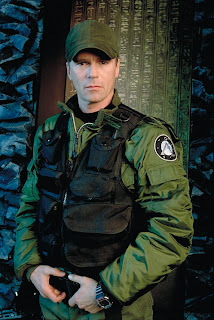 another Crossover I have always imagined with the Doctor would be with Stargate SG1. The TARDIS is sucked through the Stargate and ends up on the platform. 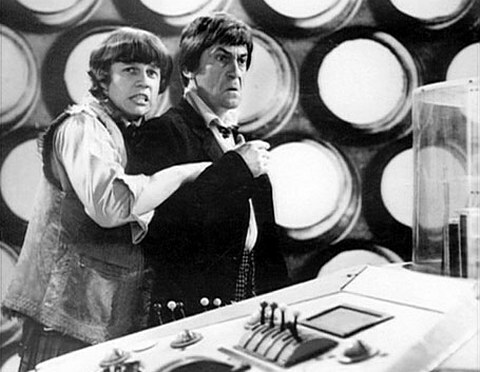 I envision the Second Doctor and Jamie, I'm not sure why I just always thought it sounded fun, and they always are fun to watch when guns are pointed at them. Once again it would be a ready made adventure for either franchise. Lots of stuff matching stuff in both franchises as well. Would love to see how the doctor (any of them) deals with O'Neil. Ford Prefect Zaphod Beeble Brox and Arthur Dent from Hitchhikers guide to the Galaxy in any other franchise! What crossover franchise crossover would you love to see? How would they interact? What would happen. Check out what other league members said this week as well. AEIOU and sometimes Why also had a vision for the Doctor! 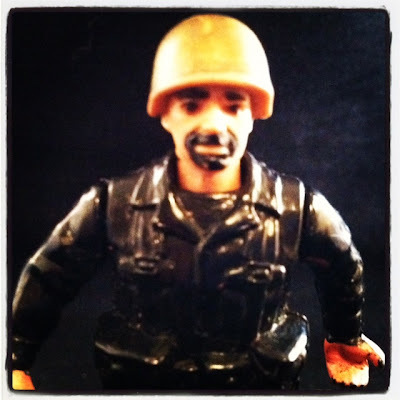 Portland Comics envisions a cartoon reality show! Sideshow Cinema thinks about how two hunters would act together!